CRETE house – Washington University in St. Louis’s first-ever entry in the U.S. Department of Energy Solar Decathlon – is like no other. First of all, it’s constructed of concrete, not wood or steel. And it eschews a traditional HVAC system, instead using water coils embedded within the panels to warm or cool the home. Over the last two years, the WashU Solar Decathlon team of more than 100 undergraduate and graduate students have created the single pre-cast concrete structure as a demonstration of integrated advanced building technology and a compelling alternative to traditional wood, light-frame construction. “With our CRETE house, we hope to show how prefabricated, self-sustaining and resilient homes can mitigate climate change,” said Ryan Abendroth, faculty project manager for Team WashU’s Solar Decathlon home, and a Senior Lecturer in architecture. Contributing to the energy efficiency of the home are Euro-design, ENERGY STAR®-certified appliances by Blomberg (www.blombergappliances.com), a rapidly growing major appliance brand for builders, designers and architects of multi-unit buildings in urban America. The winner is the team that best blends design excellence and smart energy production with innovation, market potential, and energy and water efficiency. Washington University will receive prize money of $100,000 for its participation, and the overall winner will receive $300,000. Team WashU’s 995-square-foot home will be the first in an eco-village of net zero-energy-ready buildings being planned at the Tyson Research Center, an internationally renowned biological field station sited on 2000 acres of native landscape in Eureka, Missouri. CRETE house will become the long-term residence for two research scientists. In addition to the research and development that has been put into the house during the design, construction and operation phases, the structure will be used as a test bed for further research and education. High performance precast concrete is inherently resilient, protecting against fire, moisture and mold, insects, seismic events and extreme weather conditions such as storms and strong winds. Although the manufacturing process emits carbon dioxide, those emissions are offset by the material’s longevity and unique thermal properties. Concrete boasts a high heat capacity, or thermal mass. On a summer afternoon, concrete walls absorb the warmth of the sun, slowing the rise of interior temperatures. On a summer evening, natural ventilation releases the heat back outside, dispersing it into the cool night air. 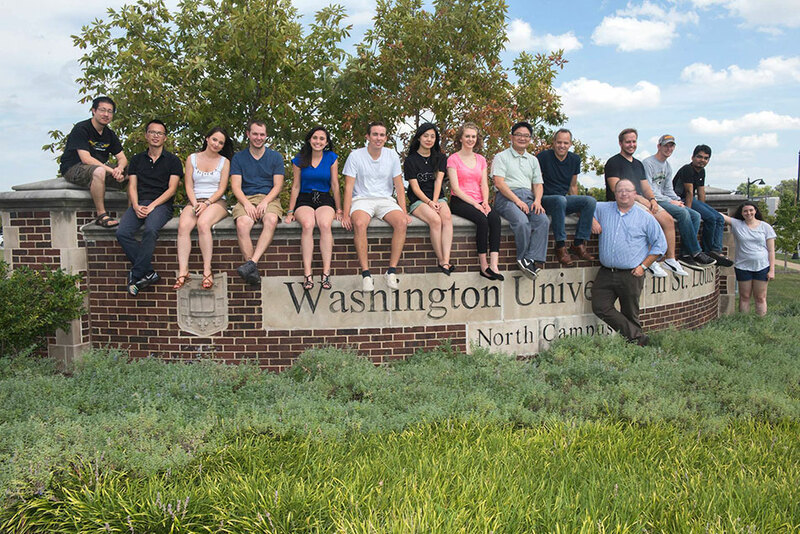 In the fall of 2015, in the first of four semester-long studios offered at Washington University as part of the Solar Decathlon project, students investigated sustainable strategies for heating, cooling and ventilation, looking for ways to reduce and/or offset energy consumption, while still maintaining a comfortable, functional space. They created individual proposals, which were eventually merged into the final design. The team includes students from the architecture, landscape architecture, engineering, computer science, construction management and public health programs. This summer, they are focused on constructing the home on WashU’s north campus, with the help of professional builders. In September, the team will pack up CRETE house and ship it to Denver for the competition. The $420,000 cost of building the home was offset by university contributions, external fundraising, in-kind donations and support from concrete companies and other industry partners. Blomberg’s innovative heat pump dryer made the Environmental Protection Agency’s (EPA’s) 2017 ENERGY STAR Most Efficient list for using 50 percent less energy than conventional dryers. Blomberg was among the first to bring the ventless heat pump technology to the marketplace. The heat pump dryer uses a closed-loop heat exchange system to dry at lower temperatures, saving money on energy bills and providing superior protection for clothes. In addition, several Blomberg dishwashers made this year’s ENERGY STAR® Most Efficient list, and all models have earned ENERGY STAR marks for using advanced technology to clean dishes brilliantly with less water and energy. Unique design features include multiple insulation layers to reduce thermal loss, and a variable speed circulation motor that automatically adjusts for optimum water and energy consumption. With its sponsorship of the U.S. Department of Energy Solar Decathlon 2017, Blomberg is going the distance to help accelerate the adoption of energy-efficient products and design in American homes.